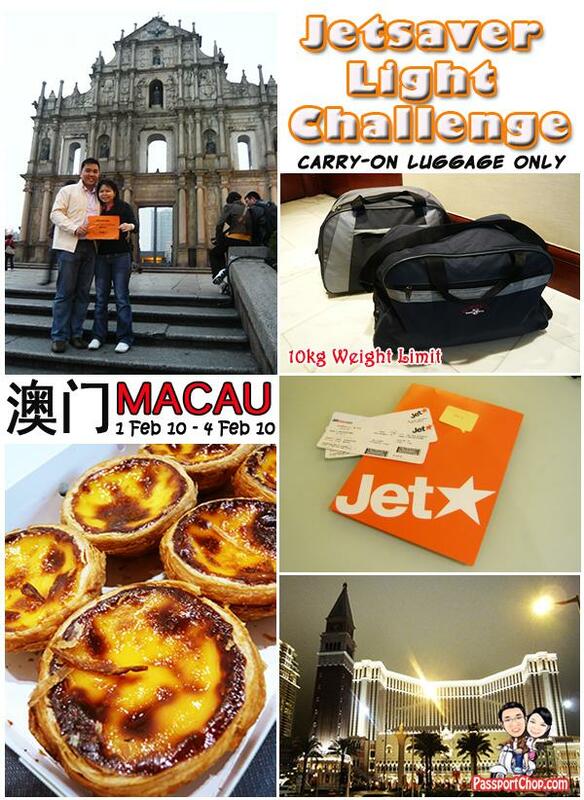 Thanks to Jetstar Asia and Macau Government Tourist Office, PassportChop.com was selected as one of the 10 teams to participate in the Macau JetSaver Light Challenge from 1 Feb to 4 Feb 2010. Participating teams are provided with return airfare to Macau, 3 nights’ accommodation and a budget of SGD 30 per person. However there is a catch – as we will be travelling on the JetSaver Light fare (as compared to the other JetSaver and JetFlex which allows for 20kg check-in luggage), we are only restricted to 10kg of carry-on luggage. That is not a problem for our team as we had adopted a simple approach to our packing – bring one set of clothings and shop for more once we arrived. Contrary to popular belief, Macau is not all about gambling and expensive, luxurious lifestyles. In this post, we will be sharing our experiences with delicious Macanese and Portuguese cuisine, interesting sights off the beaten path and tips on how to survive comfortably on a budget in Macau. To fully immerse ourselves in the Macau holiday experience, we had slightly exceeded our allocated 30-dollar budget; nonetheless, we had also included scaled-down versions of our experiences as an alternative that budget travellers can consider. 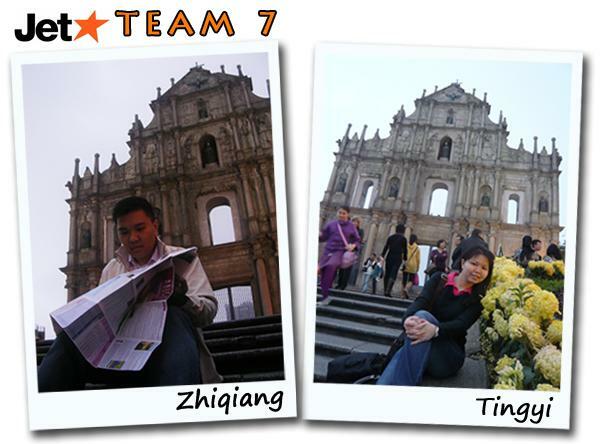 Let me provide you with a brief introduction of Macau JetSaver Light Challenge Team 7 – Zhiqiang (editor for PassportChop.com) and Tingyi (creative director for PassportChop.com). For more info on what this blog is about, check out our About page. 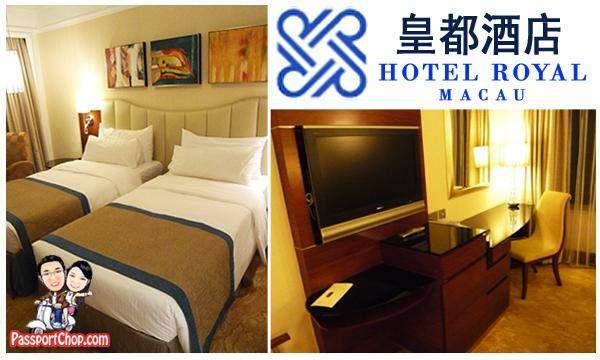 We stayed in a 5-star Hotel Royal Macau Deluxe Room which is well-located in the heart of the Macau Peninsula. It is within walking distance to key tourist attractions e.g. Ruins of St. Paul and Guia Hill and there are also complimentary shuttle services to ferry guests to different parts of Macau e.g. casinos, ferry terminal. The complimentary daily American Buffet breakfast at the classy Vasco Da Gama restaurant provides us with the fuel to explore around Macau (saves us some breakfast money too). Besides complimentary unlimited in-room cabled broadband Internet access, there are also free Wi-Fi available at the lobby and restaurants (check with reception staff for password). Despite having only about 6 hours of sleep (we checked-in at about 2am; flight arrived in Macau at 1+am), we were sufficiently energized by the hotel’s American Buffet breakfast and the prospect of bargain shopping in Zhuhai. The Chinese border city of Zhuhai is only about 15 minutes drive from our hotel and would make a good day-trip if you are looking for some cheap bargains in clothings and electronics (just remember to bargain – my post on bargain-shopping tips applies here too). Once you have cleared the Chinese border customs, you just have to proceed to the basement for the massive underground shopping complex – you can then eat, live and breathe shopping here for the next few hours. With proper planning, you can actually get around the Macau Peninsula without spending a single cent. 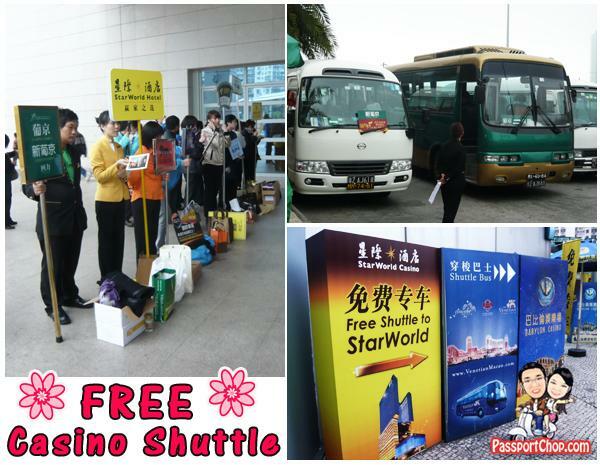 Major casinos and hotels in Macau provide FREE shuttle services from key locations e.g. Zhuhai-Macau Border Gate and Hong Kong-Macau Ferry Terminal. Key tourist attractions e.g. Ruins of St. Paul’s are within walking distance from casinos such as Grand Lisboa. If you plan to do casino-hopping, you can use the Ferry Terminal as your base since this is where most shuttle services start their route. Just to share a tip – the Ruins of St. Paul’s is best visited in the evening (5-6pm) when its more cooling and the crowd is smaller. Along the road to St. Paul’s , you will go through a gauntlet of snack shop staff trying to push you pieces of beef jerky, almond cookies etc. In fact, I believe if you walk through this 200-metre street with your mouth open, you would have tasted almost every brand and type of beef/pork/chicken jerky and almond/peanut cookies in the market for FREE. Don’t resist the offers – you are under no obligation to buy from them; however, if you are buying, consider doing so when you have returned from St. Paul’s – not wise to carry bulky boxes up the steep stairs. If you are hungry for a hot meal after all these appetising snacks, head back to Senado Square which offers a wide spread of culinary delights. 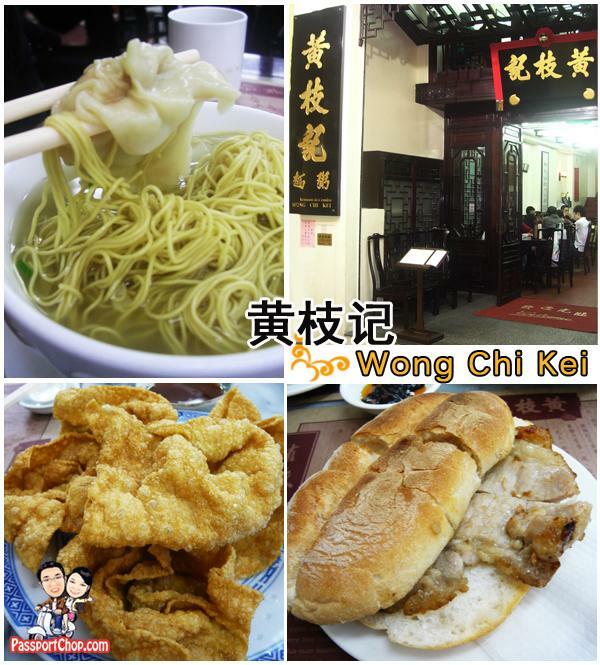 For Cantonese food, check out Wong Chi Kei (黃枝記) – the traditional Cantonese Wanton Noodle in soup is a must-try at this restaurant. It is a bargain at just 21 MOP (about SGD 4) – the wanton tasted yummy and fresh; the noodles soft and smooth and its taste is enhanced by the very appetising soup base of which we see almost every diner slurping it down to the last drop. You can also try the Pork Chop Bun (15 MOP) and the Deep Fried Wantons (22 MOP). Personal splurges (e.g. shopping expenses at Zhuhai & side dishes at Wong Chi Kei) are not included in the daily expenditure. The above calculations only highlight expenses on basic necessities for an enjoyable trip in Macau. 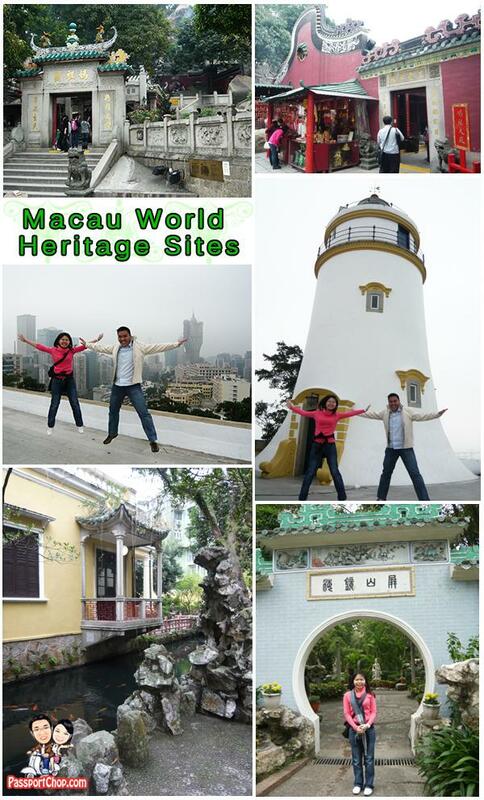 We started Day 2 at Guia Hill – Macau’s highest point where one of the 25 Macau’s heritage sites – the Guia Fortress is located. Both the Guia Lighthouse and Chapel of our Lady of Guia are contained within the fortress. The whitewashed exteriors of this structure creates the Mediterranean island romantic atmosphere – perhaps one of the reasons why this place is a must-go for wedding photos in Macau. What better way to celebrate our romantic journey around Macau then to do a Star Jump here – at the highest point of Macau! The Lou Lim Ieoc Garden is just a few minutes walk away from the foot of the mountain. This is where you can find the classic Suzhou style of miniature stone landscaping and see locals doing their tai-chis and daily morning walks. We round off our historic Macau centre exploration with Macau’s oldest temple – the A-Ma temple. This temple is always busy with both locals as well as tourists (especially from China and Hong Kong). It is a common sight to see long queues of over 20-30+ tour buses around the car park near the temple. Within the temple grounds, you will also see stone inscriptions of Chinese poetry as well as vibrant old architecture of the temple buildings. Just a few minutes walk away, we treated ourselves to a sumptuous Portuguese and Macanese cuisine at O Porto Interior – a popular restaurant well-known for its comfortable settings and ambiance. 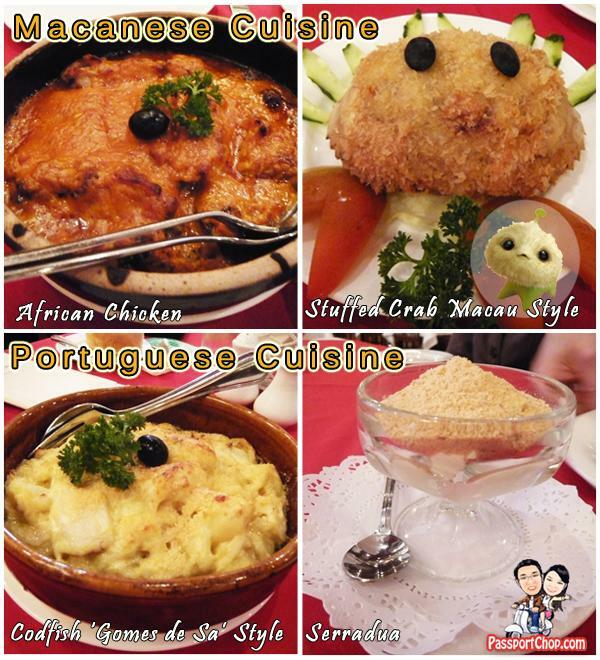 For starters, we tried the Stuffed Crab Macau Style – the presentation was surprisingly cute -> looked a bit like the alien creature CJ7 from the movie: 长江七号. The dish is actually crab meat with a layer of meat floss served in a crab shell. The African Chicken is a Macanese cuisine which had evolved from traditional Portuguese dish adapting Chinese techniques and ingredients such as spices. The curry sauce in the dish is aromatic and not too spicy and is served with rice. To complement the slight spiciness of the African Chicken, the Codfish ‘Gomes Da Sa’ style (served with potatoes, onions, fish and peppers) adds in a layer of sweetness to our lunch. We ended off our meal with 白雪金沙 Serradura Cream and Biscuits Portuguese Style (aka “Sawdust Pudding”). This dessert tasted as good as it is aesthetically pleasing as implied by its literal Chinese translation – White Snow Golden Sand. Aside from some tinges of black among the normal yellow-colored sand, this beach looked pretty much like Singapore’s East Coast beach (perhaps much cleaner) with bicycle and swimming gear rental huts dotting parts of the beach. It wasn’t a very good idea to swim at this beach due to many factors: cold weather, very strong waves and high tides. There are swimming pool complexes around the beach which offers an alternative to swimming in the seas. After walking around Coloane Village, it’s time for afternoon snacks! Just a short walk from the village, the welcoming Lord Stow’s Bakery offers yummy egg tarts at just 7 MOP. The experience of eating a Lord Stow’s egg tart is just mind-blowing; compared to egg tarts from dim sum restaurants or other bakeries in Singapore, this is way much better – the crispy crust coupled with unique taste of the soft creme bulee style fillings is just perfect! – definitely another experience worth jumping in joy for! 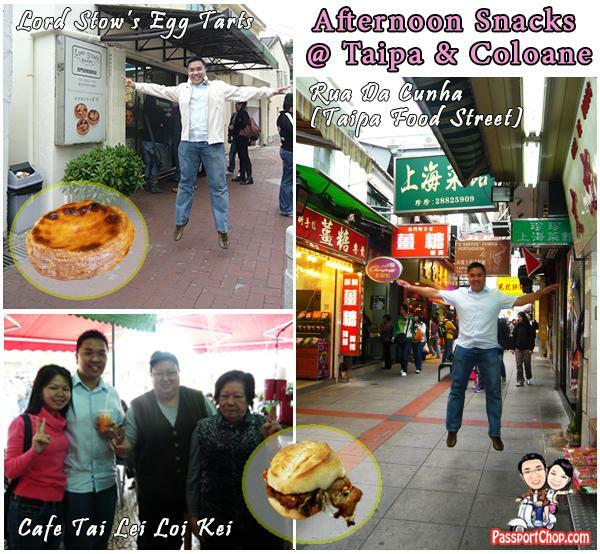 With 2 of the Islands’ famous food safely tucked into my stomach, it’s time to explore the village of Taipa as well as the famous ‘Taipa Food Street’ at Rua Da Cunha – more free food sampling! The shopkeepers here are not as aggressive as the ones along the road to Ruins of St. Paul’s. Samples are available in trays inside the shop – feel free to try their almond cookies or approach their staff to sample some of their beef jerky. This food street offers a variety of international cuisines via many famous restaurants e.g. Galo (Macanese & Portuguese food), Seng Cheong (crab porridge). We concluded our afternoon tour around Macau with a visit to the Grand Prix Museum and Wine Museum to learn about the history of the F3 Grand Prix races that are organised in Macau annually as well as the wine culture in Macau. The best thing about these museums is that admission is FREE and they are just beside each other. 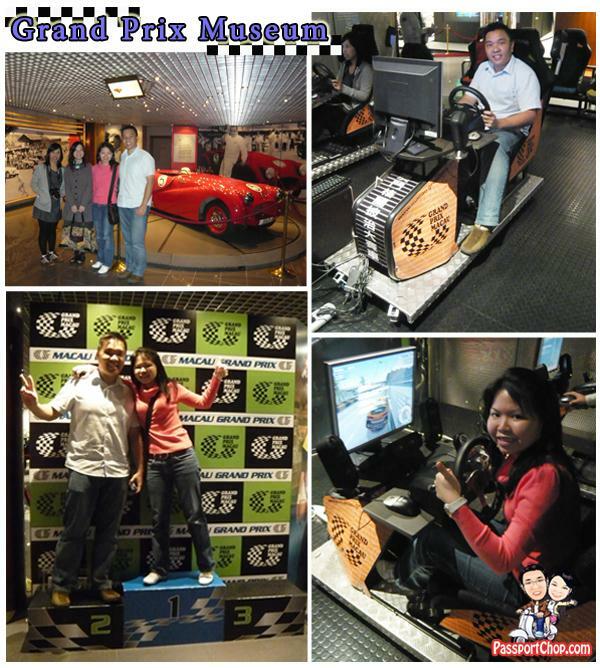 Besides a showcase of cars from the various eras when the Grand Prix was held here, we were also entitled to a free round of race simulation rides! After the simulation ride, suffice to say, I am convinced that I better stick to my day job and throw the dream of being a F1 driver out the window. I would have caused so much mayhem (not in a good way) and damage to the racing circuit and my rivals/crew/audience/anyone close enough to my car. 🙂 Nonetheless, since there are only 2 simulation rides available at a time, we see it fitting to crown ourselves Number 1 and 2 in the race! 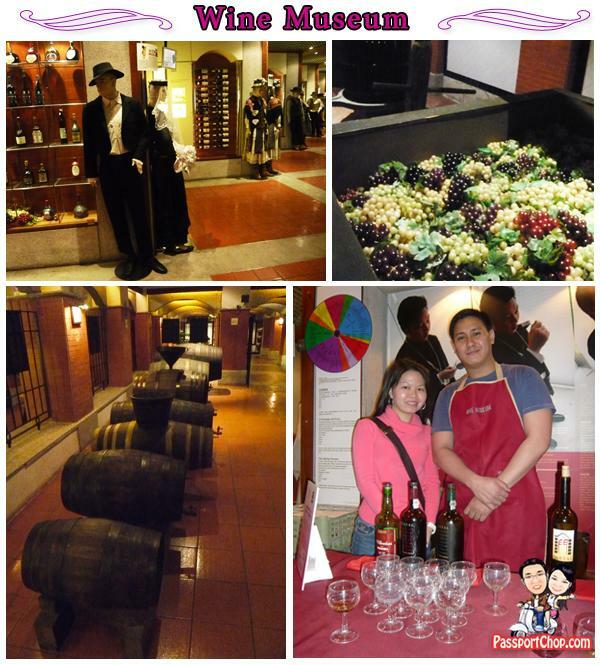 The Wine Museum showcases the steps of how wine are made from grapes and the long history of wine. What’s perhaps the most interesting part about this museum is that for 10 MOP per person, you get to sample a glass of fine wine – there is a wide selection of different types of wine – red/white; sweet/bitter. A perfect way to keep ourselves awake for our next leg of Day 2 trip – Casino Hopping! The Royal Macau Hotel provides a direct shuttle to Venetian Macau twice daily (11:30am and 5:30pm). We took advantage of this service to save us some transportation costs. 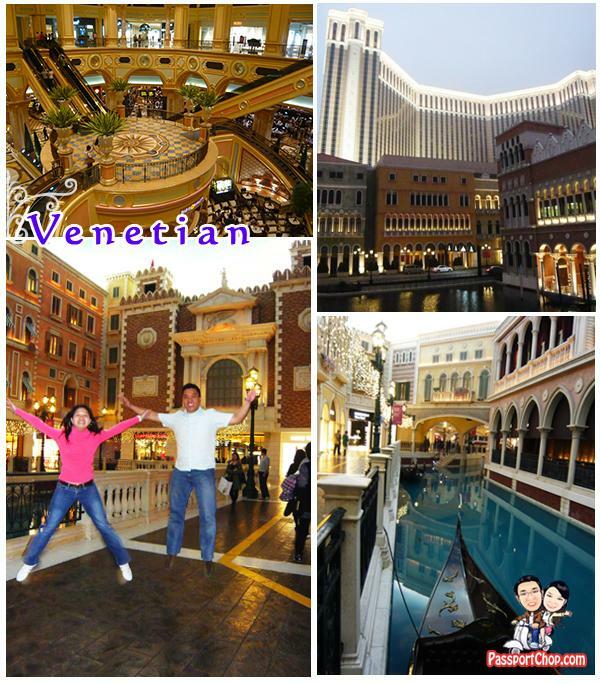 The Venetian Macau is just spectacular in terms of its size and decor both indoor and outdoor. I had been to Venice and was amazed that they had duplicated everything e.g. Rialto Bridge, canals, gondolas right down to the T. Besides gambling, you can also roam around its beautiful shopping halls which showcase various brand names from around the world. Next stop in our casino-hopping trail, we proceeded to City of Dreams (COD) which is just across the road from Venetian Macau. The key highlight of COD is its 10-minute 4-D audio-visual treat – the Dragon’s Treasure. It tells the story of the Dragon Pearl and its mysterious powers as experienced by four Dragon Kings who are magically transported along with the audience on a sensory journey to each of their respective aquatic kingdoms of ice, tropics, volcanic and solar entities. Believe it or not, this performance is actually FREE. You will need to collect your free tickets at the box office and show up at the Bubble 10 minutes before the show starts. The performance is scheduled every hour from 7pm to 10pm. There are more frequent runs during the day. Regular shuttle services run from City of Dreams to the Ferry terminal, stopping off at various destinations along the way – one of which is Hotel Sintra – from which, you can take a 5-minute walk over to Grand Lisboa. There is another FREE performance available at the casino grounds of Grand Lisboa – the Crazy Paris Show, a 5-minute show which runs every half-hourly from 4.30pm. This performance is more suited for an adult audience with scantily-clad dancers performing exciting dance routines on a small stage behind the casino bar. Personal splurges (e.g. shopping expenses) are not included in the daily expenditure. 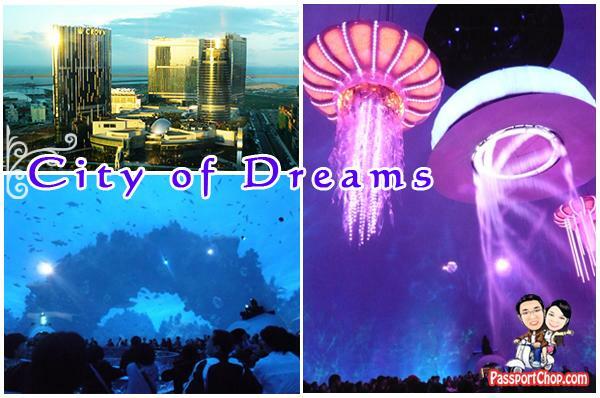 The above calculations only highlight expenses on basic necessities for an enjoyable trip in Macau. The Three Lamps District (三盞燈) is named after a lamp in the middle of Rotunda de Carlos da Maia (嘉路米耶圓形地). While there are actually 4 lamps, locals still call it 3 lamps because from far, only 3 lamps is visible on the lamppost. The surrounding streets comprises of shops selling the latest ladies’ fashion at bargain prices. Besides fashion, you can also find all kinds of knick-knacks as well as fruits, vegetables and meats for your daily groceries. It is rather surreal to find a youth fashion clothing store amidst vegetable stalls but that’s the way its arranged around this district. The shops are scattered all around the alleys and streets so take your time to explore around for bargains. Another place where you can expect to find bargains in children’s fashions, bags, daily necessities e.g. 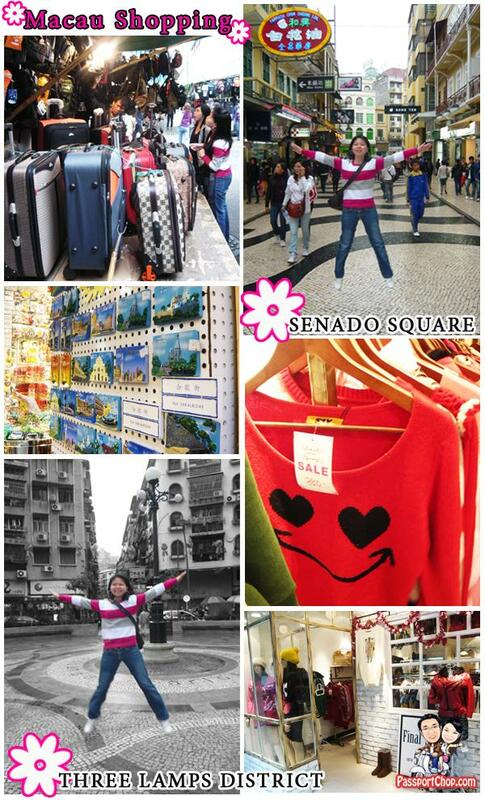 towels is in the alleys around Senado Square. Look out for makeshift stalls that are set up during the day selling these products at dirt-cheap prices. As the prices are already quite low, the stallowners usually do not entertain bargaining unless you are buying in bulk. Located at a small alley 5-8 minutes walk away from Grand Lisboa, you will find the Margaret Cafe E Nata which sells one of the best Portuguese Egg Tarts (7 MOP) on the Macau Peninsula. Having tried both Lord Stow’s and Margaret’s Egg Tarts, I felt that the one from Lord Stow’s bakery offers a better taste; Margaret’s egg tarts are sweet but lacking in the caramel smell that was so flavorful in Lord Stow’s. 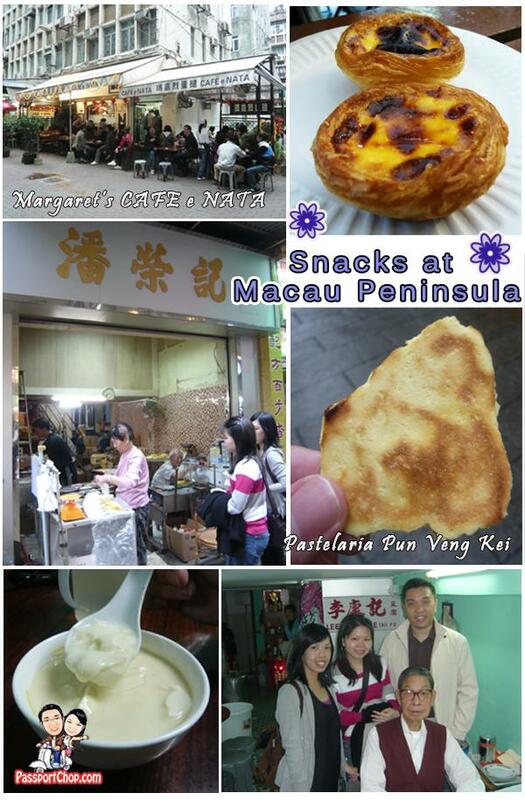 There is actually some history between these 2 egg tarts stores – Margaret and Lord Stow used to be married and after their divorce, they set up shop on different parts of Macau (Peninsula and Coloane Island) to sell their uniquely-flavored egg tarts. 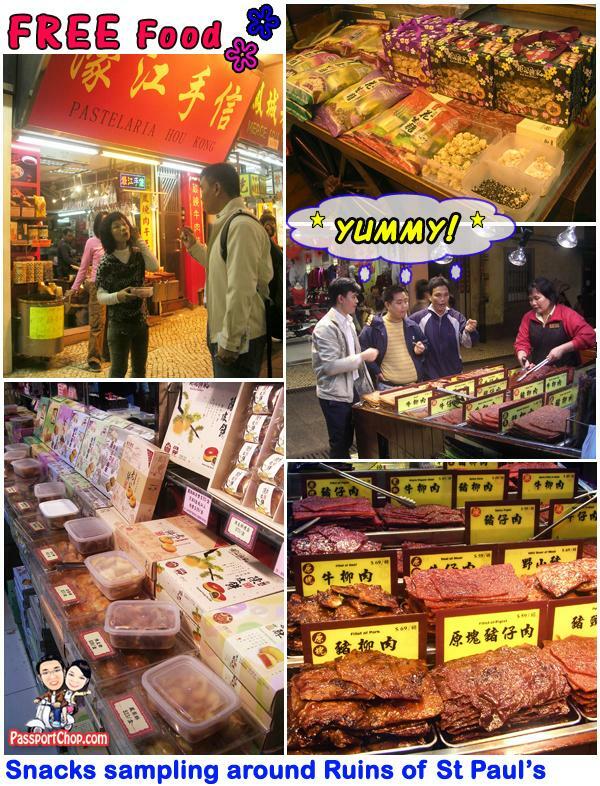 Besides egg tarts, there are a number of small stalls around Senado Square which had been in existence for many years and earned a reputation for the yummy food e.g. Pastelaria Pun Veng Kei which sells delicious golden egg crisps (1o MOP for a bagful of these crisps) and famous silky soft tau hua (soy beancurd) by Lee Kung Kee. The founder was in the store doing his accounts when we came in for our soy beancurd (5.50 MOP) – we just had to take a picture with him. 🙂 These shops are located in the small alleys – ask around for directions; locals will usually be able to help you find these places. 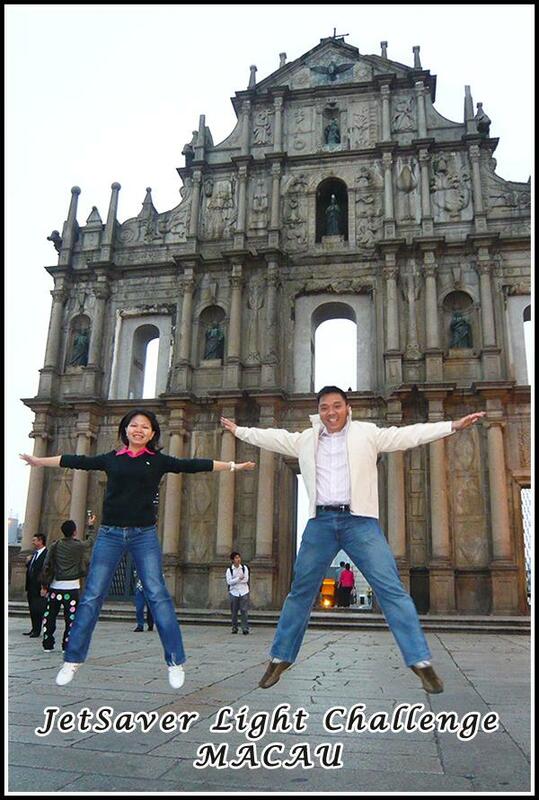 The Ruins of St Paul’s cathedral, one of Macau’s most prominent landmark, is our most memorable place because of our numerous attempts in trying to take a jump shot in front of the facade – low lighting combined with our clumsiness (mostly me) in trying to synchronise with the camera flash, resulted in many embarrassing attempts before arriving at this perfect shot. This also kick-started the whole series of jump shots around Macau as we got more thick-skinned and more skilled in synchronising our jumps, in the process making new friends and sharing a laugh with tourists as well as locals. 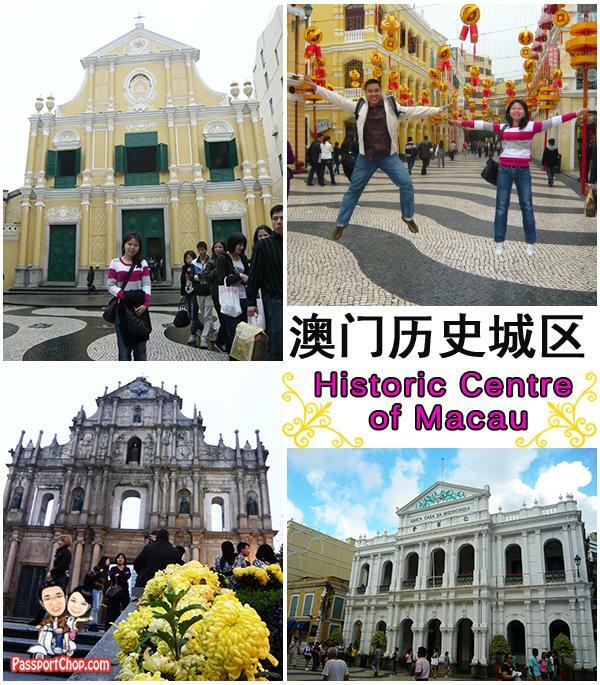 Nice post on Macau ! Too bad i have school and not yet 18 to take part in this. Day1 : May I know where do we get the free shuttle to Zhuhai? Day2: How did you travel from Guia Fortress to A-Ma Temple? You did not mention the mode of transport in your Day2 summary. 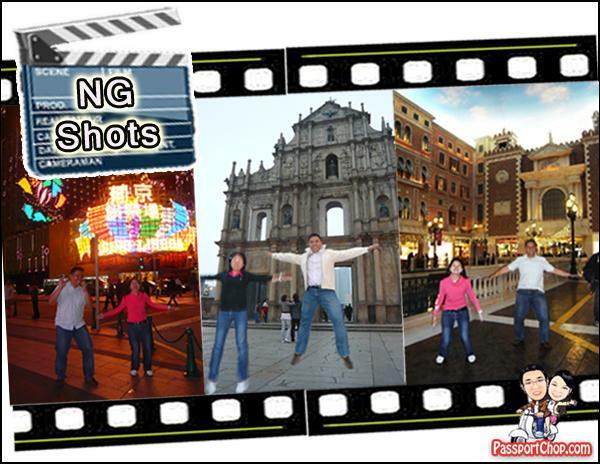 .-= travelisveryfun´s last blog ..4D/3N Macau Trip Jan 13-16 Summary / Itinerary =-. yo both! Group photos can send to me (original)? .-= thoo2´s last blog ..旅游：流浪到淡水（下） =-. Great to see your blog, and thanks for your email and photos! Planning a macau trip! 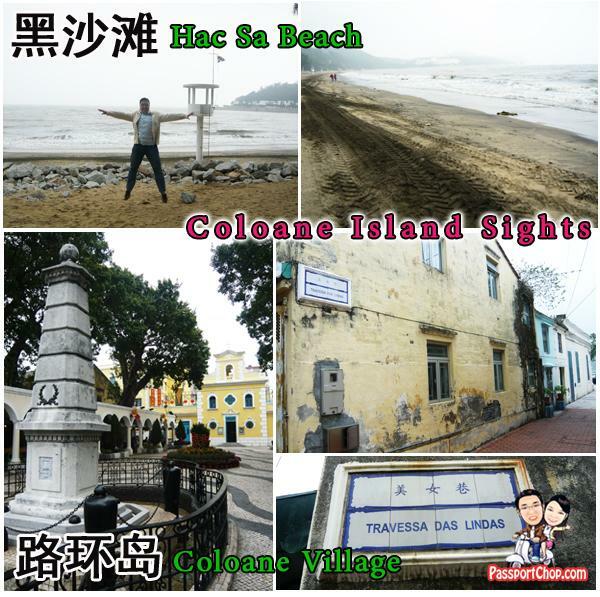 Wondering how do you get from around A-ma temple to Coloane Village and then from Coloane Village to Venetian Macau? A-Ma temple to Coloane Village Bus 21 and then Bus 26A to Hotel Lisboa where we caught a shuttle bus to Venetian. 🙂 Hope this helps. Hi. 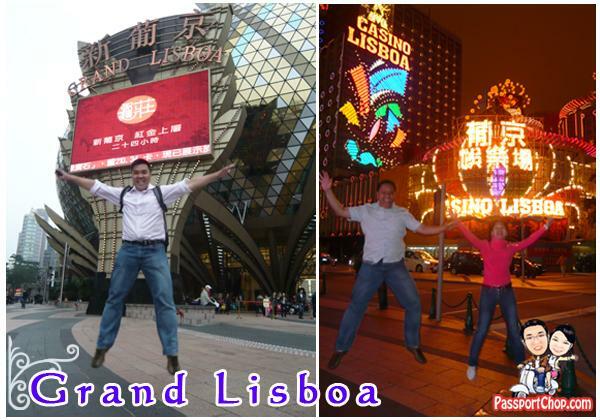 I will be going Macau in April 2011. I’m planning on my itineries. 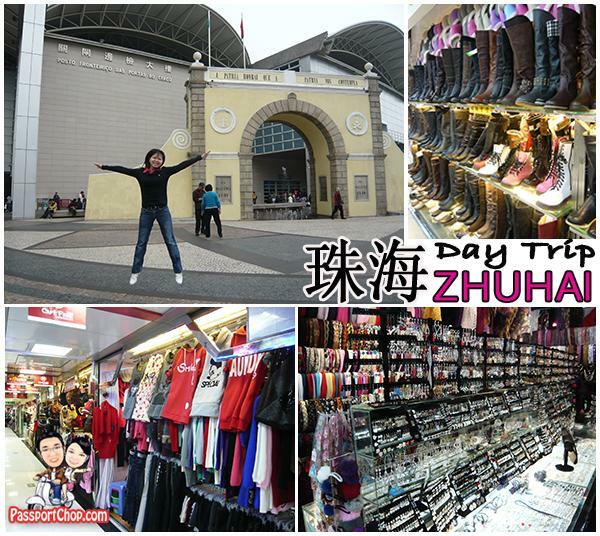 How did you go to Zhuhai? I have asked Hotel Lisboa and they said that they do not provide any free shttle bus to Zhuhai. Is the bus from Hotel Lisboa? I’m having the same situation as you as I will be checking in the hotel at 2am. However, they will be charging me fully for it (1 night rate). Is it the same for you? Hi ST – we took a cab from our hotel to the border – quite cheap, less than 15 sing dollars for a cab and we split the fare so even cheaper. alternatively, take the free shuttle bus from hotel to macau ferry terminal and take a shuttle from there or go to any hotel that has one. As our trip was arranged by jetstar, we had early check-in for free. i believe its industry practice to charge full night for it. I thought you were saying that you took a shuttle bus from Royal Macau Hotel to Hotel Lisboa then from Hotel Lisboa to Zhuhai for free? Do you know any hotel that provides free shuttle bus to Zhuhai? You mean that I can take shuttle bus from Hotel Lisboa to macau ferry terminal and change to a shuttle bus that can bring me to Zhuhai from the ferry terminal?